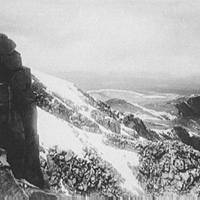 In 1858, when Julia Archibald Holmes became the first woman on record to reach the summit of Pike's Peak, she did so wearing bloomers, a short dress and moccasins and called the outfit her "American costume." Julia, her husband, and two others began their trek up the high peak in Colorado on August 1. Four days later, they had reached the top of the mountain, 14,110 feet high. Many people told Holmes she couldn't make it. What's the biggest challenge you've faced?